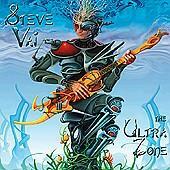 Those of you who read my concert review of Steve Vai's gig on the "Ultra Zone" tour know that I hold the man in high esteem. Any worse and I'd be worshipping him like the god I rationally know him to be. I am really glad he decided to share the magic and beauty of one of his recent performances with the world. Unfortunately it's no "Ultra Zone" tour show, but a performance from the tour to support the "Alive in a Ultra World". Good thing about this tour is that it brought Tony MacAlpine on second guitar and Billy Sheehan on bass. Bad thing is that he didn't play "Voodoo Acid" anymore. Well, it's been said before and it will no doubt be said again, you can't have everything. "Live at the Astoria London" is a double DVD. The second DVD features behind-the-scenes footage and more stuff that DVD buyers expect but that you'll probably only watch once. It's pretty interesting, but, um...once is enough. All the excellence is on the first DVD, where we get 21 tracks spanning Vai's career (as well as a little of Billy Sheehan's). The sound is excellent and it's really the next best thing to actually being able to be at a show in person. There's Vai's showmanship, his exorbitant clothes, the extensive guitar showcasing (or guitar wanking, as may be the case) and let's not forget Billy Sheehan's bass demi-god presence. Video-wise there are perhaps a few too many extreme close-ups, and sound-wise it has to be said that Tony MacAlpine's keyboard solo is worse than extremely boring. And I do wish Steve'd dump the chewing gum habit.